We can’t deny the fact that the real time nature of social media is actually shaking the entire role played by a content marketer. Reports reveal that more than 4.75 billion pieces of content are shared everyday on Facebook, 95 million videos and photos are shared on Instagram and 500 million tweets are done per day on Twitter. With such statistics, it can be indeed daunting to harness the amount of social data and social insights. Internet marketers usually pay close attention to digital signals which are sent by consumers through social media platforms so that they could deliver engaging, relevant and customized content for customers. As more and more companies evolve into experienced business firms, utilizing social insights will allow them to create an emotional connection with their customers. This way they can send the right content to the audiences at the right time, thereby increasing ROI and driving customer loyalty. 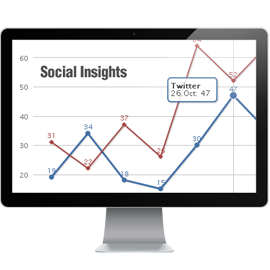 When social insights are used effectively, it can help marketers know their audiences and improve creative assets. Take a look at the few ways in which content marketers can use social media insights to enhance their strategies. Ranging from some of the major events like Super Bowl to all the breaking news that’s going on in the world, content marketers need to know what consumers are trending on social media. It is through social data that marketers know their audiences, where they’re paying attention and the things that they’re engaging in. The marketers ultimately get to know whether or not their content is timely and it resonates. The social teams should be using the social networks to keep their finger on the pulse of something that is happening globally and locally. Once you get to know what is going on, you have to share the data with your content marketing team so that they’re able to deliver compelling and relevant content. There might be a geo-specific event which a company can use to relate its content and appeal to its audience. Marketers shouldn’t allow content marketing efforts to reduce to a costly gamble. People have the habit of trusting what their peers say. In fact, those shoppers who interact with their audience through consumer-generated content are 98% more likely to convert with a retailer than a customer. Remember that user-generated content is necessary for companies as it allows them to drive more awareness and engagement with people who are not within their present customer base. Marketers should extend the reach of such content from social networks by incorporating that content to their digital properties to engage customers. Therefore, if you’re someone who is wondering about the importance of social insights in content marketing, you should consider the factors mentioned above. They will all ultimately drive engagements and increase your brand visibility.